Real talk: Most of us don’t have the means to consistently eat free-range chicken, grass-fed beef, local eggs, or organic produce. I’m right there with you: while I’d love to have all these things, they’re just not practical and I’ve got to choose my plate wisely. Whether you're on a budget or not, grocery shopping is one of the main ways you can save money every week, and I've picked up some excellent money-saving strategies in this arena. Healthy food doesn't have to be expensive, and these are some of my best tips for staying healthy on a budget. Make a plan, make a list, make a run. Meal prepping in general is a money-saving strategy (you saw this coming, right?) If you plan what you eat and eat what you prepare, that’ll prevent mid-week grocery store runs and unexpected fast food trips. Follow these steps the day before your grocery run. The day before you’re ready to meal prep, start thinking about exactly what you want for the week. Ask your spouse what they are craving. Start browsing recipes. That way, ideas are in the forefront of your mind. Before you shop, inventory your fridge and pantry first. Is there a jar of tomato sauce you can use up? Is there some meat in the freezer you can defrost? I bet there is! After you’re done with inventory, start writing the grocery list. To save even more money on groceries, check out my next tip below. Sign up for reward programs and use digital coupons. Smiths (Kroger) has an amazing rewards program; I use it every week. Their savvy app lists promotions throughout the store (Buy 4 Save 4 is a big one). You can also clip digital coupons on the app. This has been HUGE for us. I’ve been following Fun Cheap or Free for a while and Jordan Page has turned me into a freezing fiend! She has SEVEN freezers (watch the video below to see everything she's freezing). We primarily use our deep freezer for meat. When there’s a meat sale, we purchase way more than we need and freeze it for upcoming weeks. We browse the discounted meat at our grocery store and freeze that, too! If free-range, local, or organic meat is a priority for you, why not purchase a quarter cow and store that in your freezer? You’ll save much more money than buying it weekly. Save big-time with bulk foods. Two bulk food strategies that work: Buy exactly what you need –or– buy a bunch in bulk. When to buy a lot: If you eat things like rice, pasta, nuts, or chia seeds nearly every week, purchase them from the bulk section of your grocery store. They are substantially less expensive than buying a box off the shelf. When to buy a little: If you’re trying out a new recipe, shop the bulk section! I ran into this situation recently when I needed nutmeg and bay leaves: two spices I don’t use very often. A spice jar would run me $3 - $5 off the shelf. But both are available in the bulk section for just pennies on the dollar. I picked up 5-6 bay leaves and only spent 24 cents. WIN! Think meal prepping takes all day? Think again. The complaint I hear most about meal prep is that it’s time consuming, that’s why I created this guide with 11 meal prep staples and the fastest ways to prep them. It also includes 30 tested recipes that hold up great for weekly meal prep. This guide’s free! Read the instructions below to skip payment. We pay for convenience, whether it’s pre-cut veggies, marinated (or fully cooked) meats, or even meal plan services! But if budgeting is a priority, you can save loads of cash buying whole ingredients and preparing them yourself. Yes, it's a $100 investment, but well worth it. 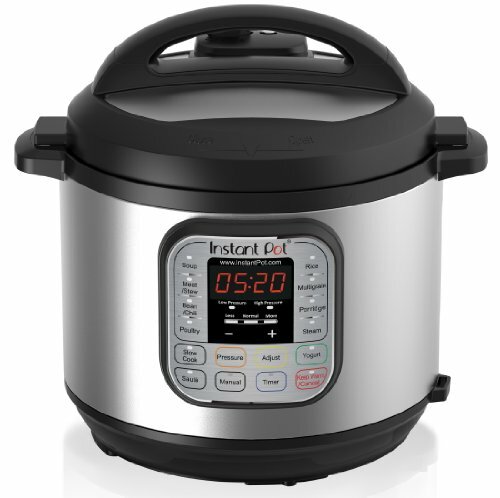 The Instant Pot saves us time and money every week on whole food items. We buy bulk quinoa, rice, and beans, then throw them in the pot. They're done in 20 minutes and taste way better than pre-packaged. Protein's pretty easy, too. You can boil perfect eggs in 10 minutes or make shredded chicken from frozen in about 20 minutes. SO EASY. Check what’s in season here and shop accordingly! In the summer months, we love bountiful, colorful salads or fresh smoothies with plenty of veggies and fruit. In the winter, we make hearty meals with squash, potatoes, and other dense root veggies. When fresh food isn't in season, frozen or canned produce comes through! If you're craving a tropical smoothie bowl in the dead of winter, a bag of frozen mango or pineapple contains just as many micronutrients! Only shop once a week. Raise your hand if you’ve ever gone on a mid-week grocery run and come out $30 later baffled about what just happened? This used to happen to me all the time and all those small trips really add up. Next week: try knocking out all your shopping in one sweep. Grab everything you need and force yourself to eat what you have. No cheating with fast food runs. Report back on how much money's left at the end of the week!